A Narukami G Guardian who supports Thunderstrike, along with a Heal Trigger to support Counter Blasts! AUTO Generation Break 1: [Choose 1 face-down G Guardian from your G Zone, flip it face-up] When this card is placed on (GC), you can pay the cost. If you pay it, your opponent chooses 1 of their Rear-guards, Retires it, binds it face-up, and if you have 2 or more Rear-guards than your opponent, your opponent chooses 1 of their Rear-guards, and retire it. 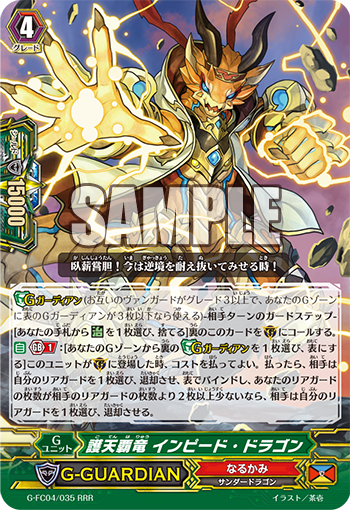 AUTO: [Soul Blast 1] When this card is discarded from your hand for the cost of Calling “Sky Guardian Supreme Dragon, Impede Dragon” from the G Zone, if there are 1 or less face-up cards in your Damage Zone, you can pay the cost. If you pay it, Counter Charge 1. For Today’s Card, we’re introducing the following from “Fighter’s Collection 2017” (on sale May 12th, 2017): The Generation Break 1 《Narukami》 G Guardian, “Sky Guardian Supreme Dragon, Impede Dragon” and the Heal Trigger “Meditate Dragon” that activates its ability when it’s discarded from the hand for the Cost of Calling the related G Guardian. “Sky Guardian Supreme Dragon, Impede Dragon” is a Retire-focused G Guardian. When it’s placed on the field, your opponent chooses a Rear-guard, Retires it and binds it! And, if you have 2 or more Rear-guards than your opponent, your opponent chooses and Retires an additional Rear-guard! Even in a troublesome situation where you have fewer ally Rear-guards, this is a reliable G Guardian that can turn the tide. Also since the first Unit retired is bound, it has a role in supporting 【Thunderstrike】. Since it has no Counterblast or so such Cot, it can easily be used. Continuing, we introduce “Meditate Dragon” who can activate its ability when discarded from the hand for the Cost of Calling “Sky Guardian Supreme Dragon, Impede Dragon”! You can Counter Charge 1 card if there’s 1 or less face-up cards in your Damage Zone. So it’s a handy ability that lets you cover a Stride Skill Cost next turn! Q. Can you discard “Meditate Dragon” for the Cost of Calling G Guardians other than “Sky Guardian Supreme Dragon, Impede Dragon”? Q. Can you Call “Sky Guardian Supreme Dragon, Impede Dragon” while you have no face-up G Units? Q. When there are 3 face-up G Guardians in your G Zone, can you activate the effect of “Sky Guardian Supreme Dragon, Impede Dragon” by flipping a G Guardian face-up? ← [Article] Cardfight Retrospective: Gold Paladin Pt.3; Some like it…Blue Hot?